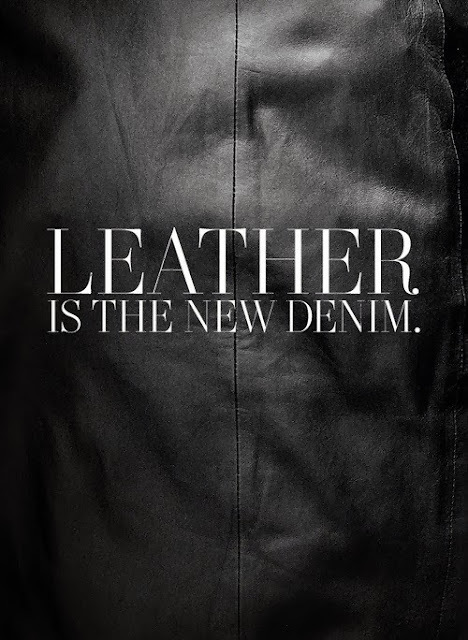 Everyone's wardrobe needs "something leather", forget the days of wearing those baggy blue jeans - Leather is the new denim and it's here to stay!! I remember the days when leather clothing, particularly jackets, were a reflection on heavy metal and punk subculture. However as time has passed and fashion has evolved, it's become an on-going fashion trend, as the previous three seasons have passed, it seems to remain strong and dominant in everyone's fashion wardrobe. Back in the 90's people used to only think leather was a material used in jackets when you wanted to look "cool" or "retro" however, leather is not incorporated in a multitude of garments ranging from pieces such as tops, leggings, dresses, corsets and skirts. This spring summer saw an increase in demand for leather skirts, although its a heavy and durable fabric, many fashionistas managed to incorporate it into their cute feminine summer styles, I had noticed that almost every high street retailer had stock different ranges of leather skirts, from skaters to pencil skirts. I mostly enjoyed browsing through pinterest and tumblr and seeing all the different combinations you could match a skirt with. The most frequent style I could see was the crop top paired with a skater leather skirt. I noticed that leather was for-seen as a form of high fashion, therefore by high street stores offering cheaper options, the younger market were allowed to create a high fashion edge to their wardrobes by having such pieces in their wardrobe. Leather has is also accessible for those who want to style up their work wardrobe, when styled correctly it can provide a smart yet contemporary look. As seen above, Naya Rivera manages to pull off a peplum semi leather top with a simple black leather pencil skirt. Tips to remember when matching leather black on black, as much as it's a chic look, it's always useful to remember to wear statement shoes to ensure your outfit isn't too matchy matchy. Also when deciding on the choice of bag, it's always good to carry a clean and simple bag, however experiment with different colours to contrast with your outfit, like the yellow clutch Olivia Palermo is holding. I would like to majorly emphasise how much I love leather leggings and jeans, it's a definite MUST HAVE in any women's wardrobe, they are uber comfortable yet keep your look modern and trendy (killing two birds with one stone ladies!) My favourite shop to buy leather leggings from are Zara & Berskha, they allow me to wear them during the day time (casual) and then I can restyle them in the evening by just changing a top and adding accessories.